We love the Muppet show, and have most of it on DVD. While I was sick for a week or so, my children watched far too much television, and one of the things they watched was the episode with Harry Belafonte (because it followed the one with Elton John). I know this doesn't sound like it has much to do with worms, but bear with me. After we watched this episode, which is lots of fun, by the way, Isaac started telling me about big tarantulas that live in our yard (!) and like to dig up worms. I wasn't feeling well, so listened with half an ear, but it seemed to satisfy him, and I didn't think any more about it. The next morning, however, he informed me that it was Worm Day! (He was quite enthusiastic about Worm Day.) 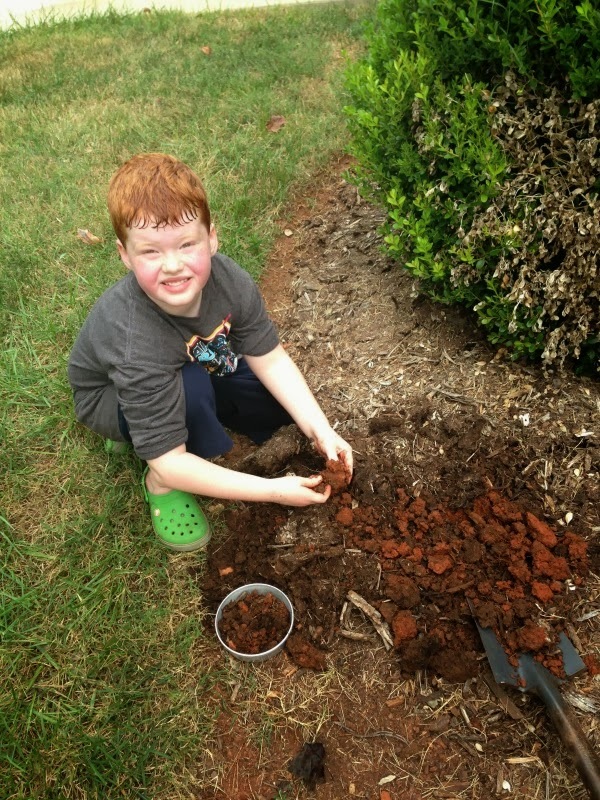 His plan was to go outside and dig up worms, so we could save them from the spiders and the birds. I did not know prior to these conversations that spiders would eat worms. Heh. We have lots of worms in our flower beds, and it makes me happy to see them there, because it means the soil is healthy. It also means we don't have to look very hard to find them. 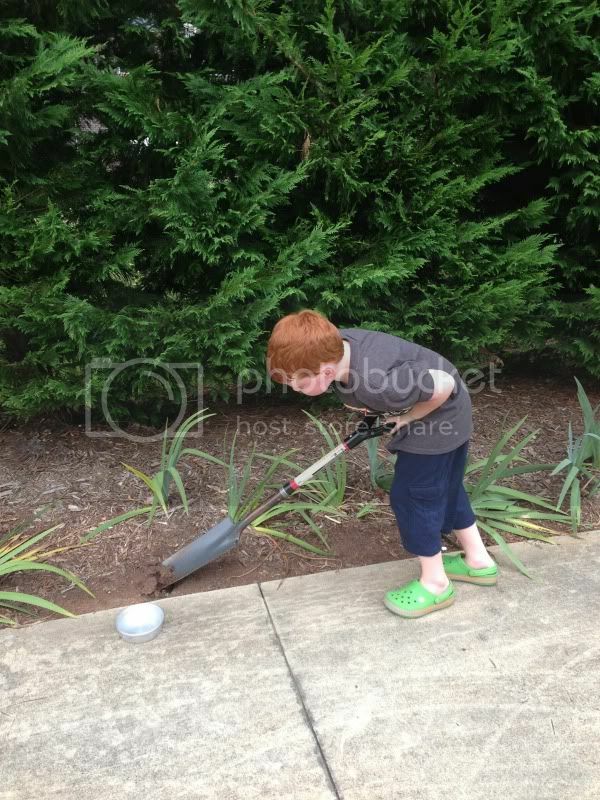 Isaac walked right over to the iris bed and began digging. That didn't work as well as he'd hoped, so he decided to try the other direction. 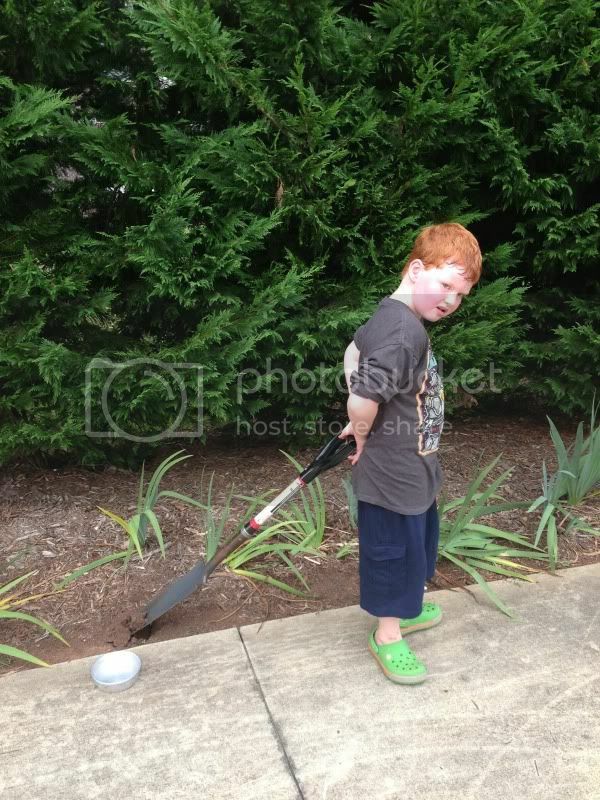 At that point, I asked if he'd like a little help with the digging, and he said he might, so I stepped in. It didn't take us long to find several worms, which made Isaac happy. I think there were even different kinds. There were some skinny, red, very wiggly ones, and some fatter, gray, more sluggish ones. He'd brought out a little cake pan, so we put them in there at first, but then we decided to put them in a jar. We have this great book called Pets in a Jar, and it told us what to put in with the worms. 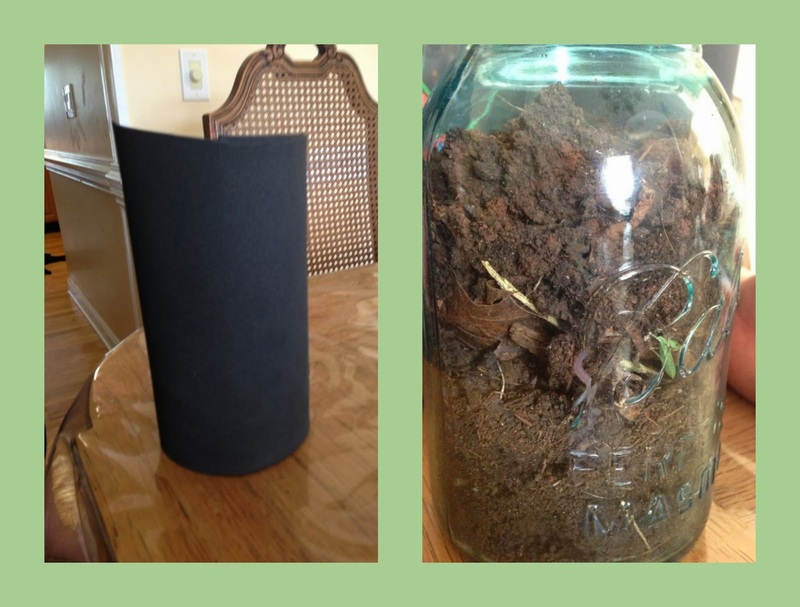 The book also told us to cover the jar with some black paper Isaac found a large sheet of black craft foam. He loves craft foam. (He sleeps with a yellow sheet of craft foam right now. I have no idea why.) We were also instructed to keep the jar in a cool, dark, place, so Isaac put it in the freezer compartment of his play refrigerator. I can't see any harm coming to them there, so that's their home for the time they live with us. We're also supposed to put different kinds of food in there for them, and pay attention to what they like to eat. I'm willing to do that, but haven't had great success keeping worms alive in the house in the past, so we'll see how they do. Today, we brought the jar out to see how the worms fared. If you want to look closely enough, you can see one of them next to the "B" on the jar. If you don't want to look that closely, that's okay too. I think it's still alive, even! It might be a record. I would love to be able to study them for a week or so and see if we can observe tunnels they make.